Celebrating: Some of last summer's high-achieving GCSE students, including Tom Senior, second right, and Emma Belward, fifth right. 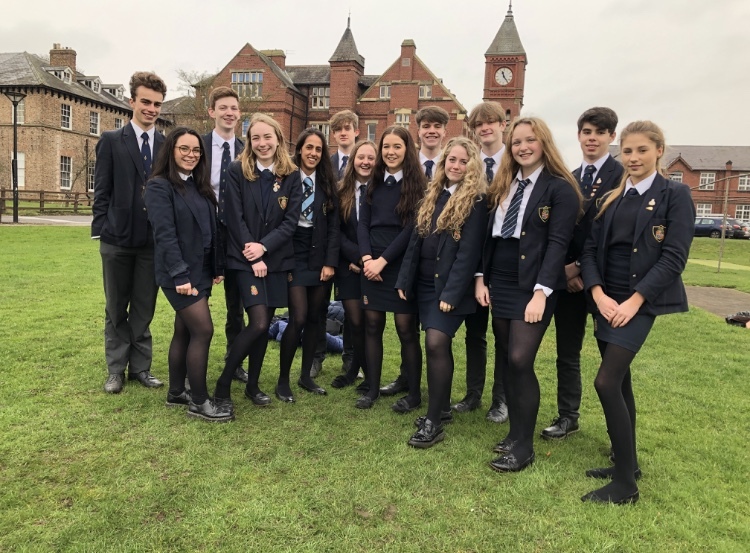 STUDENTS are celebrating taking Ripon Grammar School to new heights in the national league tables as latest exam results place it in the top 15 schools in the country. RGS’s exceptional GCSE results, alongside the progress students make, have secured its high ranking in the Daily Telegraph’s ‘Top 100 schools’ league table, which includes both independent and state schools. RGS is the only school from Yorkshire and the North-East to make it into the top 40. With eight A*/9-8s and two A/7s at GCSE, she is among the 95% of students who gained A*-B/9-5 grades at RGS last summer: “The teachers here are fantastic and really help the students. Everyone works hard and deserves the great results they get,” she added. Headmaster Jonathan Webb congratulated both students and staff for their outstanding achievements, especially during such a period of educational change, as schools adapt to new and expanded syllabuses and styles of assessment. “This is a testament to the quality of teaching and learning at Ripon Grammar School. Students have worked hard to attain so highly, building an excellent platform for their studies at A-level and beyond,” he said. The Daily Telegraph ranks schools according to the percentage of students achieving five or more A*-C/9-4 grades and Progress 8 scores, which measure progress in eight core subjects from primary to secondary school. A neutral 'zero' measure at Progress 8 means a school is performing at the national average. With a score of 0.98, Ripon Grammar School is performing significantly better than the average school.